One of our roles here at Visit Spokane is to advocate on behalf of the tourism industry on legislative matters. The Washington Tourism Alliance (WTA) was formed to advocate for a sustainable statewide tourism program and help to promote all of Washington as a destination. Right now, the WTA is preparing legislation that will support its tourism marketing objectives. These strategic marketing plans, when implemented, will increase incremental travel to Washington. We are delighted to announce we&apos;ve launched a new trip planner on our website! 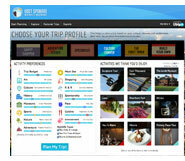 Utrip is a free travel planning tool that creates custom itineraries based on the user&apos;s interests, budget and more. Visitors can access the trip planner from any page on the Visit Spokane website, or they can go directly to the Utrip website at plan.visitspokane.com. Check it out for yourself, and don&apos;t forget to share your trip on social media with the hashtag #PlanSpokane. You heard us talk about it for weeks, but did you hear the results? Spokane was ranked as the #2 Best American Riverfront in the U.S. in the USA Today 10Best poll! Thank you to everyone who voted! You can see the full top ten list here. Regional Director of National Accounts Karen Staples traveled to the CMP Conclave in New Orleans, September 6-8. The conclave is a gathering of 450 certified meeting professionals around the U.S.
Vice President of Sales and Services Keith Backsen, Director of Sales Shannon Shannon and Director of National Accounts Brooke LaFleur attended the MPI/PCMA Summit in Seattle, September 16-17. Karen Staples was joined by the Spokane Convention Center&apos;s Kelsey Soukup, September 17-19, at the SGMP-NATCAP in Washington D.C. The duo also attended PCMA Education Day in Philadelphia and traveled to New York City for appointments and meetings with ACLS. Senior Director of Business Development TJ Hake and Business Development Sales Manager Julianne Kerley traveled to Anchorage, AK, September 16-20, for the 2014 DMAI Membership Summit. The attendees were from the US and Canada, all representing DMOs and sharing member/partner programs and ideas. Director of National Accounts Sonja Hughes and representatives from Red Lion Hotels, DoubleTree by Hilton Spokane City Center and the Spokane Convention Center traveled to Atlanta, September 28-31, for Rejuvenate Marketplace. The Visit Spokane team secured 30 one-on-one appointments with association meeting planners within the religious market. Keith Backsen, Karen Staples, Regional Director of National Accounts Kim Ritten and the Spokane Convention Center&apos;s Jessica Deri attended IMEX America in Las Vegas, October 14-16. The Visit Spokane team shared a booth with Visit Providence and, together, visited with 62 planners and networked with many more. Director of Operations & IT Valeta Sweet attended DMAI&apos;s Finance, Operations & Technology Summit in Miami, October 19-22. The conference is an opportunity for leadership in finance, operations and technology to attend education sessions, discuss best practices and more. Where in the World is ACE? 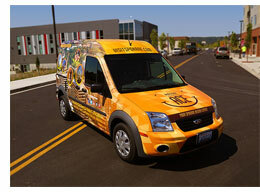 Don&apos;t forget to follow Ace on Twitter at @VisitSpokaneACE. The Washington Tourism Alliance and Visit Spokane invite you to participate in the Northeastern Washington Regional Meeting for an informative discussion regarding the WTA 2015 legislative objectives, including the details of the industry-funded assessment model and governing principles for a future statewide tourism marketing program. Please join us following the WTA presentation for the Visit Spokane Holiday Open House! Food and drinks will be provided. Our quarterly e-zine is chock-full of seasonal things to do in the region. We are currently working on finalizing the winter e-zine, which will be sent to subscribers in January. 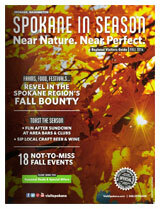 If you are interested in advertising, please contact Julianne Kerley at jkerley@visitspokane.com or 509.363.6832. Click here to view the fall e-zine. Riverfront Park is getting all dressed up this holiday season, thanks to Spokane Winter Glow! To help make the first year event a success, the crew is looking for some volunteers. If you are interested, please contact Phil Robinson at 509.280.7775.